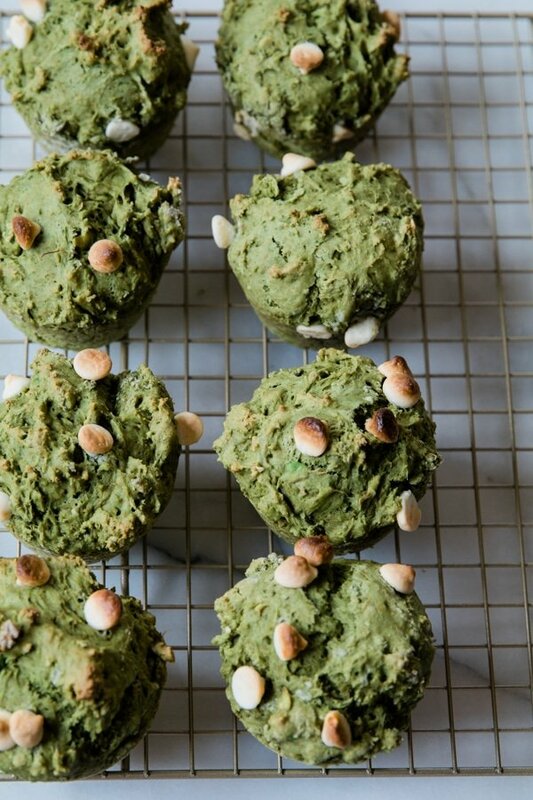 These Avocado Matcha Muffins are the perfect muffin to kick off your morning. Whether it’s a weekday or brunch on a weekend, these muffins will hit the spot! Happy Monday! We’re back from our trip!! We had such a wonderful time exploring New York City together. I cannot believe we were so fortunate to be able to step away from our home for a solid 10 days. I must say…It feels DAMN good to be back! I missed the routine. The work. The work outs. Family. Friends. Fresh produce. Don’t get me wrong, it was a good vaca, but I’m happy to be back home, and blogging! With the said…it’s already time for another MUFFIN MONDAY post! 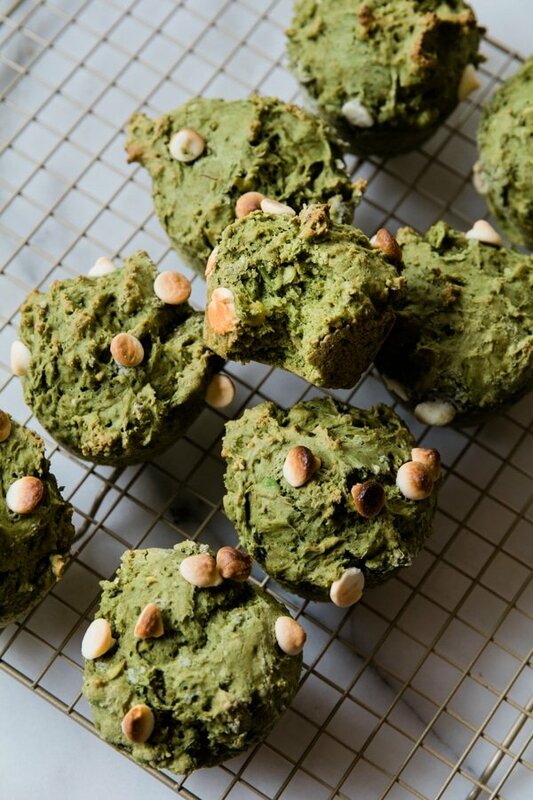 These avocado matcha muffins are a little more on the healthy side as far as muffins go. They contain avocado & hemp seeds for a nutritional boost of healthy fats and protein. Matcha is a very fine green powder made from the green leaves of tea bushes grown in the shade. It’s the only tea where the leaves are consumed as part of the drink rather than being infused in hot water. Therefore, the antioxidant content is higher in matcha than other teas. Matcha is also a significant source of L-theanine, an amino acid unique to tea. I sweetened these bad boys up with maple syrup instead of granulated sugar. You can use coconut sugar instead if needed. Regarding the all-purpose flour, if you need a substitution I recommend 1 1/4 cup almond flour and 1/4 cup coconut flour! Instead of whole milk, you can also try using a non-dairy milk. I think almond milk is a great choice! I added in white chocolate chips for fun, but they are also totally optional! I think they compliment the matcha flavor nicely. Try mixing them into the batter too! The chocolate chips got a little toasty on top, but I like it that way! Or, I also like folding the chocolate into the muffins! Take only 15-20 min to bake! 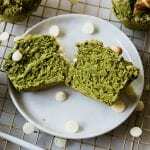 These Avocado Matcha Muffins make for a great snack or can be a perfect part of a balanced breakfast. Preheat the oven to 350 degrees F. Spray a cupcake tin with PAM or line with liners and set aside. In a stand mixer using the flat eded beater (or use a food processor), mix the avocado and maple syrup together for 1-2 minutes. Then add in the milk, lemon juice, egg and vanilla extract. Blend and set aside. In a separate medium sized bowl, whisk together the flour, matcha, hemp seeds, baking powder and salt. Gently fold this dry mixture into the wet ingredients. Stir in chocolate chips or you can sprinkle some on top (optional step). Scoop batter into prepared muffin tin and bake for 15 minutes or until a toothpick inserted into the center of a muffin comes out clean. Enjoy! 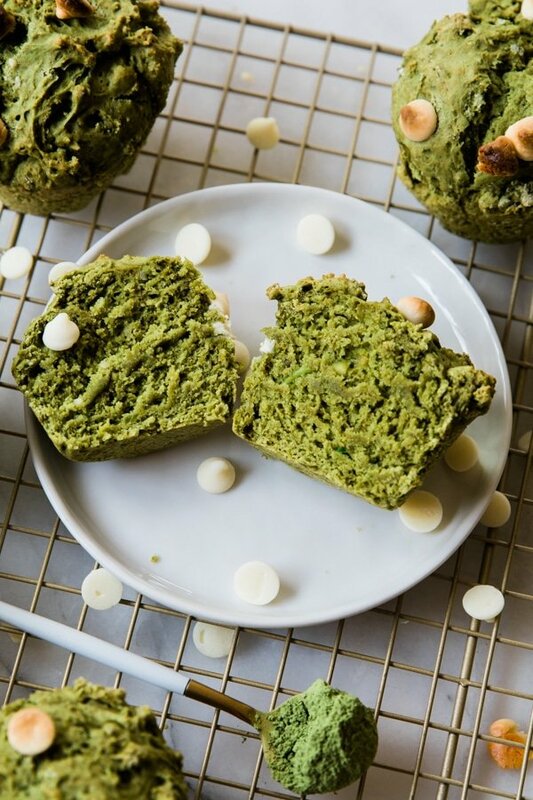 PIN THESE AVOCADO MATCHA MUFFINS FOR LATER! Ohh these look awesome. And my kids actually love “green muffins”.. and I love white chocolate chips! These would be perfect for St. Patty’s Day! Love the sound of this recipe! I’m wondering if kids can eat these? ?